This is nice. Amidst all of the busy busy busy everything, I am just sitting here, doing nothing, and having a cup of tea. Perfect tea moment. I should be doing other things. Lots of other things. But I’m not. This isn’t the first time I’ve had this tea and originally I had a different write up for it. Something far more chaotic as chaotic was the flavor of the day when I originally started the entry. * This moment is far more deserving of a blog spot though, as these moments are by far rarer in my schedule as of late. I’m not even going to ruin it with sarcasm or cynicism right now. *gasp* It’s a beautiful, early fall day outside and I’m going to enjoy the rest of my delicious cup before I have to go beat on people with sticks at martial arts. Dry: It smells great. Slightly floral, slightly green. Aroma: Also smells so good. Less green smelling though. More of a light floral/citrus note. Flavor: Mmm. Also good. And no astringency! Or very little anyway. 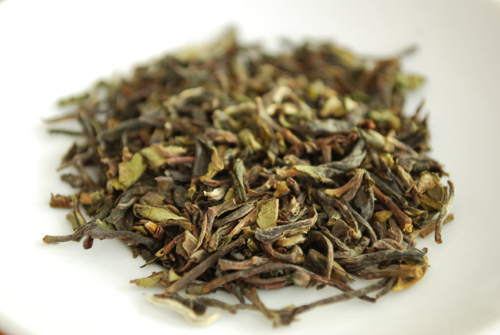 Pretty straightforward darjeeling flavor. I’m drinking this hot but could also see it being alright cold. In fact, I believe all three teas in the August box are supposed to be good for iced tea. I’m really not big on iced tea though. Requires patience that I don’t possess at the moment. Resteeps: 0 – I don’t know where the flavor went. Just wasn’t there the second time around. (I’ve verified this twice now. Pretty diminished flavor on the first resteep. Tea Score: 75 – A nice darjeeling. *I tend to sample a tea, take notes, pictures, etc. and then sit on it for awhile – usually because it takes me awhile to upload the photos to my machine and then process them in PS. By the time I post, it’s usually the second or third time I’ve had the tea and 1-2 weeks since I first sampled.